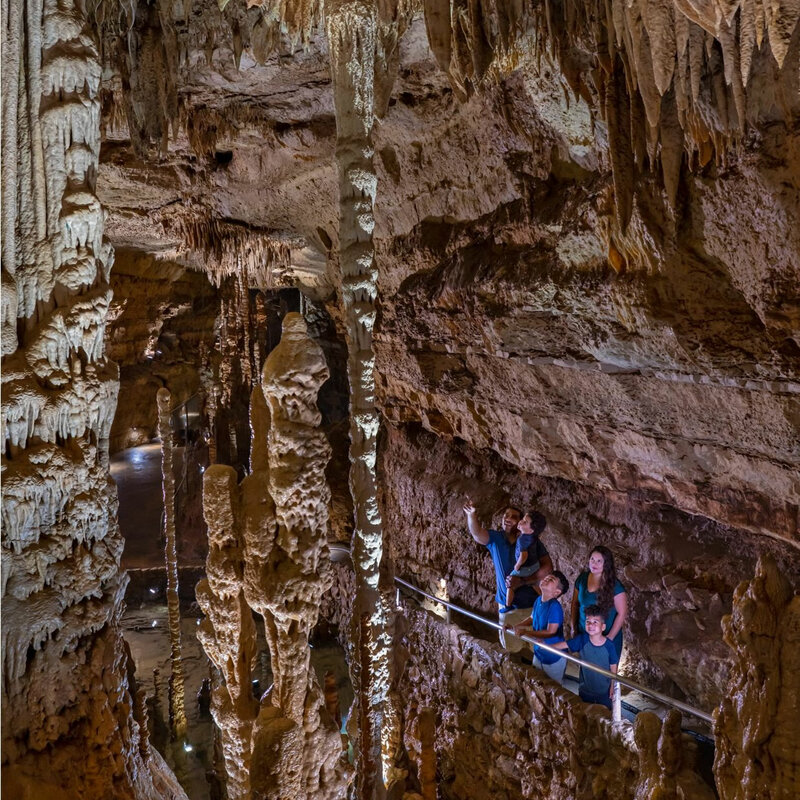 Located just North of San Antonio Texas is one of the world's premier caverns, Natural Bridge Caverns. The Hidden Passages Tour takes guest up-close to rare and delicate cave formations with dramatic lighting and includes a total darkness experience. Solutional caves are the most frequently occurring caves and such caves form in rock that is soluble, such as limestone, but can also form in other rocks, including chalk, dolomite, marble, salt, and gypsum. Rock is dissolved by natural acid in groundwater that seeps through bedding-planes, faults, joints and so on. Over geological epochs cracks expand to become caves and cave systems. The largest and most abundant solutional caves are located in limestone. Limestone dissolves under the action of rainwater and groundwater charged with H2CO3 (carbonic acid) and naturally occurring organic acids. The dissolution process produces a distinctive landform known as karst, characterized by sinkholes, and underground drainage. 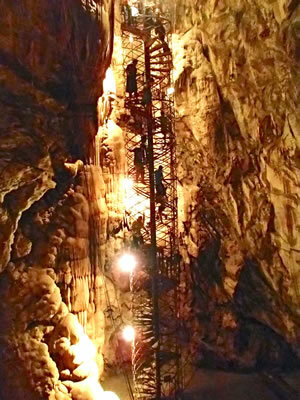 Limestone caves are often adorned with calcium carbonate formations produced through slow precipitation. These include flowstones, stalactites, stalagmites, helictites, soda straws and columns. These secondary mineral deposits in caves are called speleothems. Lava tubes are formed through volcanic activity and are the most common primary caves. As lava flows downhill, its surface cools and solidifies. Hot liquid lava continues to flow under that crust, and if most of it flows out, a hollow tube remains. Examples of such caves can be found in the Canary Islands, Jeju-do, the basaltic plains of Eastern Idaho and other places.Kazumura Cave near Hilo, Hawaii is a remarkably long and deep lava tube; it is 65.6 km long (40.8 mi). Talus caves are formed by the openings among large boulders that have fallen down into a random heap, often at the bases of cliffs. These unstable deposits are called "talus" or "scree", and may be subject to frequent rockfalls and landslides.